The Wild Deer Research Project is a joint Scottish Natural Heritage/Forestry Commission/Scottish Government project awarded funding through the Scottish Government's Contract Research Fund. It was set up with a view to "Meeting the challenge of wild deer research to support delivery of sustainable deer management in Scotland". 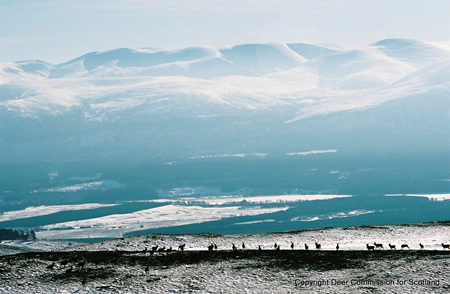 The Wild Deer Research Project has been established to help deliver the long-term vision of sustainable deer management in Scotland as encapsulated in Scotland's Wild Deer: A National Approach (WDNA). This key document sets out the Scottish Government's approach to the sustainable management of wild deer in Scotland. The WDNA vision is that by 2030 we will 'Manage wild deer to achieve the best combination of benefits for the economy, environment, people and communities for now and for future generations'. It has been developed by private bodies, membership organisations, partnerships, and government agencies in a process led by Scottish Natural Heritage. In summary, WDNA informs strategic thinking and guides actions on the ground. The aims of the Wild Deer Research Project are to review existing research on wild deer management, identify research gaps, gather stakeholder views, encourage the use of research and facilitate knowledge exchange. The research provided a fuller, more analytical understanding of the issues involved in deer management, helping deliver targeted, informed and sustainable deer management in Scotland. As part of the project, the contractor, Scotland's Rural College (SRUC), working with the Centre for Mountain Studies at the University of the Highlands (UHI) held a series of six workshops (four regional, one for policy makers and one for training providers). These were held to help identify what research on deer management we have and what research we don't have but need. The Wild Deer Research Project is not a part of the 2016 Review of Deer Management. It is a separate piece of work, which was scoped in early 2015. However, an interim report from the deer research project, due at the end of June and any relevant findings were referred to in the 2016 Review. The project report can be downloaded from the SNH website.